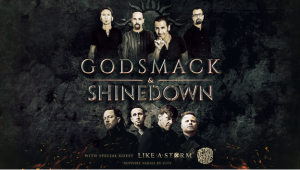 This summer, rock fans across the country should prepare to be rocked hard when the GODSMACK/SHINEDOWN co-headlining summer tour hits more than 30 cities. Produced by Live Nation, the six-week outdoor amphitheater tour kicks off July 22 and make stops in Los Angeles, Las Vegas, Dallas, Atlanta, New York and many more before wrapping September 2. These dates come as both multi-platinum groups are set to release new albums: Godsmack‘s WHEN LEGENDS RISE (April 27 via BMG) and Shinedown’s ATTENTION ATTENTION (May 4 via Atlantic Records). Tickets are available to the general public starting Friday, March 23 at LiveNation.com. WHEN LEGENDS RISE, Godsmack‘s first album in four years, is due out April 27 via BMG and marks their debut on the label. The new album comes 20 years after the release of their debut album and 20 million album sales later, Godsmack are an even stronger animal than before. The album’s newly released single, “Bulletproof,” shows the band–Sully Erna [vocals, guitar], Tony Rombola [guitar], Robbie Merrill [bass], and Shannon Larkin [drums]–doubling down on their combination of tightly wound riffs, rhythmic fury, naked emotions and pushed-to-the-edge vocals, all fired up with melodic precision and tight songcraft. What inspired the songs on WHEN LEGENDS RISE? “It was just about evolving as a songwriter,” says singer and songwriter Sully Erna. “I wanted to stretch my wings out even further to use all the experiences I’ve had with writing different types of music over the years and applying that to find a way to introduce a newer, fresher, more mature sound, but still maintaining the power of Godsmack.” WHEN LEGENDS RISE is available for pre-order now (here) with instant grat track, “Bulletproof.” Listen to “Bulletproof” here. An official music video is coming soon. 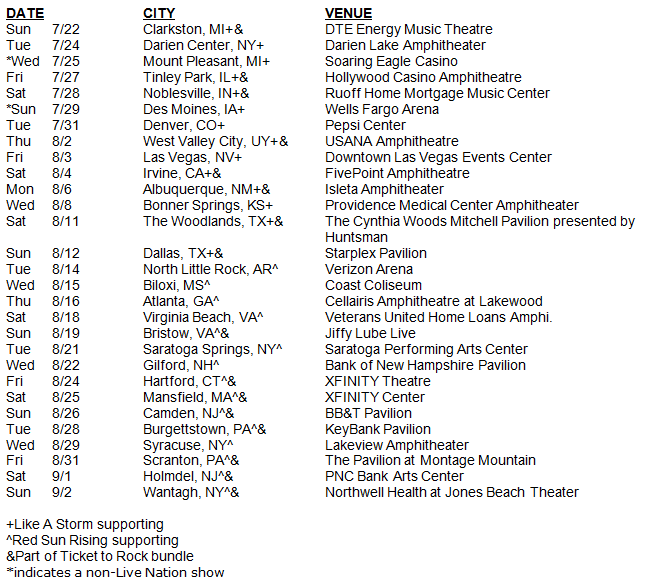 For more information on Godsmack, visit the band’s website here.